Boxes at Rumsey Hall. Seated: Jess Garcia ‘19. Standing, left to right: John Martiska ‘19, Nick Vial ‘20, Shannon Gao ‘20, Mimi Dattilo ‘19, Kate Luff ‘20, Selina Xin ‘19, Sabrina Capodicci ‘20. 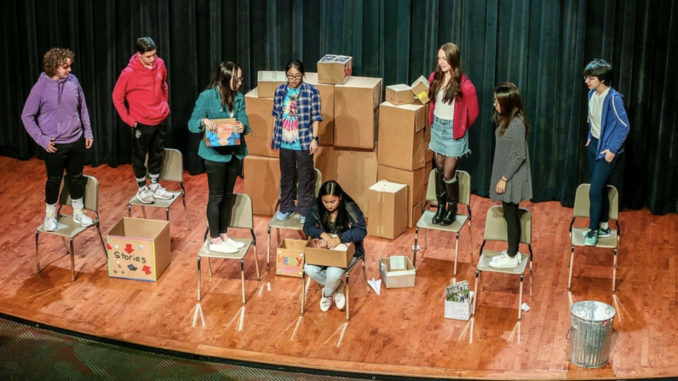 A show very different from the plays or musicals that Canterbury has put on in the past, “Boxes” tugged at many of the audience’s heartstrings with its deep meanings and metaphors. The actual boxes carried around by many of the characters represented the influences and desires placed on us by those around us, both on the expectations they hold for us as well as the emotional baggage we all carry as a result of our personal lives and experiences. 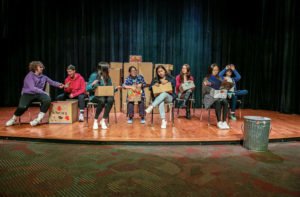 The cast of eight included veteran Canterbury actors Jess Garcia ‘19, John Martiska ‘19, Sabrina Capodicci ‘20, Selena Xin ‘19, Nick Vial ’20, and Shannon Gao ‘20, along with some new faces, including Mimi Dattilo ‘19 and Kate Luff ‘20. Each actor played two different parts in two different productions. Boxes actors perform a scene during the show at Rumsey Hall. 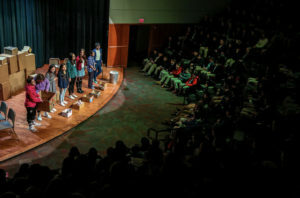 Another new feature of the play was the fact that they took it “on the road” visiting a variety of schools including St. Michael’s in Beacon, NY, Rumsey Hall and Washington Montessori in Washington, CT, and the New Milford Public Library. Talking to the cast and crew made it evident that the production was a more collaborative endeavor than the average play. For instance, actors had the ability to personally pick what their characters would wear and how their boxes would be decorated, giving them the opportunity to dig deep into both of their characters’ lives and find the best way to represent each of them. And, the talk-back sessions at the end of each performance allowed the audience to ask all kinds of questions about the show and its meaning. The sessions were a favorite of not only the audience but also the actors, who felt the sessions drew them closer to the different communities. It also provided the actors with an opportunity to explore their characters and the play’s meaning further, and in unexpected ways. Boxes actors prepare to speak to their audience at Rumsey Hall. The show’s impact on me was to make me realize how far I have come in such a short time, as I reflected on the emotions and experiences I carry. I believe that everyone who saw the show felt a connection they were able to share with the community around them. Next year’s winter production also promises to be an “out of the box” experience. It will be a collaboration between Nick Vial and Mrs. Armstrong – so stay tuned.